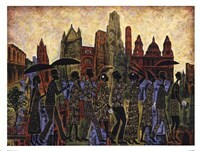 This decorative print by Corey Barksdale is of three black ladies in formal attire. All three are wearing long black and gold dresses with intricate patterns. Their hair is adorned with gold. They appear to be dancing, their arms stretched out in ballet poses. The women are part of a mural and blend into the background that includes gold skies, a black and reddish brown sun, arched windows and doors and various abstract patterns. Supper imposed on the print are drawings of a church interior with pews, columns and cathedral ceilings. These images are like flames, with light purple outlines, rising from the base. The style of the painting is very reminiscent to that of Gustav Klimt’s known as Art Nouveau. It was a movement that emerged in Europe during the late 19th and early 20th centuries that was very ornamental and was characterized by intricate linear designs and flowing curves based on natural forms.